Acne is never something you’d expect to be dealing with well into your 20s, 30s or even 40s! There are many reasons someone might break out when they thought they left that acne life in their teens, and unfortunately, they involve regular “getting older” reasons. According to the American Academy of Dermatology, a study exploring how prevalent acne is in adults over age 20 revealed that more than 50 percent of women between the ages of 20-29 and more than 25 percent of women between the ages of 40-49 were affected by acne. So, yes, the magical time in which most women are dealing with new-found wrinkles, they might also still be dealing with acne. Acne can be annoying and ruin a lot of people’s day, week, and even month! But you can’t let it control you! 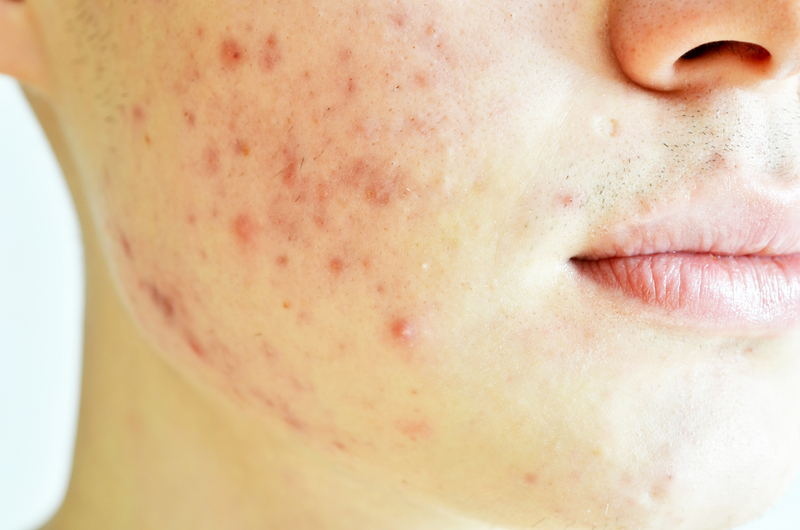 The first thing you should remember is that acne is like SUPER common. Don’t be fooled by the advertisements you see on billboards and magazines because of 1000% of those models have imperfections on their skin that gets deleted in photoshop! Women’s Health Magazine reports that acne occurs when first, excess oil and dead skin cells mingle. They plug up your pores, which allows a hoard of bacteria to settle in and cause havoc. While teen acne tends to appear on the forehead, cheeks, and nose, adult acne usually shows up along the jawline, chin, and neck. The excess is oil production is caused by hormonal fluctuations and an increase in cortisol, aka the stress hormone. You don’t even have to be pulling-your-hair-out stressed, regular daily stresses can cause a flare-up. Get to know your skin type. This is will help you when you are looking into products for your skin. If you know your skin type and your “problem areas,” you can better assess which products to buy. Of course, wash your face daily. This one is obvious, but it’s important to remember that when it comes to skincare, cleansing and treating your skin properly is key to keeping breakouts away. And for those lazy days, keep a stash of face wipes on hand. They’re not perfect, but at least if you use them, you’ll go home with a clean face. Exfoliate your skin, but don’t over exfoliate. This is true for both physical and chemical exfoliants. You don’t need to exfoliate more than 2-3 times a week; once if you use a good product. Use a new towel as often as you can when drying your face. Dirty towels can carry bacteria and can potentially introduce new bacteria to your face. MOISTURIZE! Even if you have oily skin, moisturizing your skin is extremely important. When skin is dry and dehydrated, oil glands tend over do it with the oil production, which can make acne worse. Look for a moisturizer that is lightweight and oil-based and won’t clog your pores. Though sunscreen is heavy on the skin, there are many different brands that sell SPF products that are lighter, so you can get SPF without having to worry about clogging your pores. Don’t skip washing your face after: working out and sweating a lot and wearing a full face of makeup. Makeup covers pores which doesn’t allow the sweat to make it to the surface of the skin and can eventually lead to clogged pores. Trapped dirt and bacteria in pores creates the perfect environment for acne bumps and zits to thrive. You should take a full shower after working out, especially if you are prone to body acne. Bacteria that lives on the skin can get trapped in the hair follicles and cause inflammation, something that is amplified when you exercise, and your body heats up. Food that can spike up your insulin can cause inflammation and an acne flare up. Foods like leafy greens and fruits rich in antioxidants and nutrients can counteract the inflammation and improve your skins overall quality. Limit the amount of dairy you consume, since milk contains hormones and antibiotics that can make acne worse. Your skins hydration starts from within: drink water! Water can improve your overall health and your can get even more of it by drinking unsweetened tea, specifically spearmint and green tea. Spearmint tea has potential anti-inflammatory benefits, while green tea can help fight hormonal acne and reduce insulin levels, which means the skin produces a smaller amount of sebum. Waiting for acne to clear up can be quite a journey, which is why patience is vital during the process.